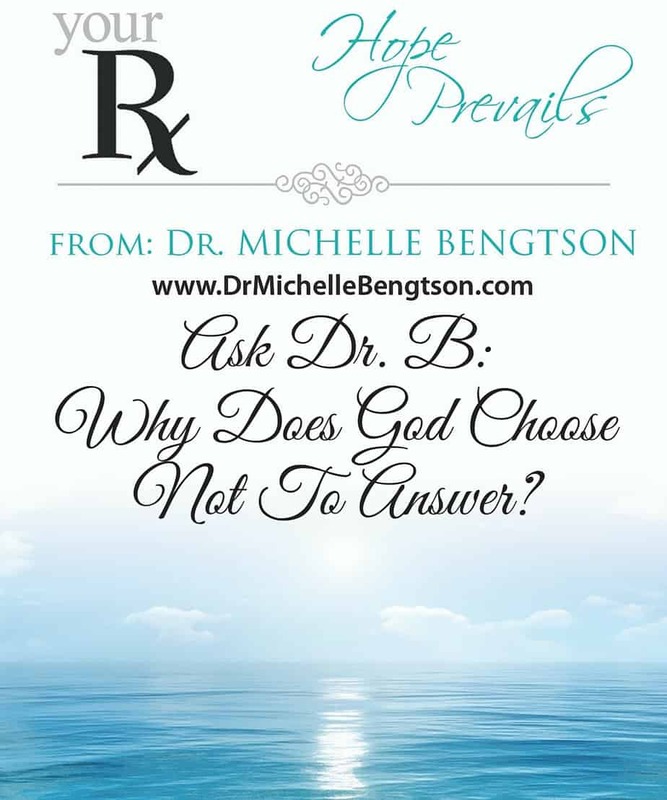 Ask Dr. B: Why Doesn’t God Answer? I’ve prayed and prayed to God. Why does He choose not to answer? I understand your frustration. In my own experiences, I have learned that God answers our prayers, although the answer may not come the way we were expecting or in the timeframe we anticipated. But, in His perfect timing, the answer comes. If we want Him to answer in a specific way, we limit Him and may not recognize the answer and may interpret the answer we miss as an unanswered prayer. Scripture is clear that God hears and answers prayer. In Psalm 65:1-2 NLT, “What mighty praise, O God, belongs to you in Zion. We will fulfill our vows to you, for you answer our prayers.” And, “you faithfully answer our prayers with awesome deeds, O God our savior. You are the hope of everyone on earth,” in verse 5. What do God’s answers look like? Sometimes he answers “Yes.” We can usually identify when He answers with a yes. That answer may come the way we expected or as an immediate answer. We rejoice because we know He heard us. Our faith and confidence grows. When the answer is “Not Yet”, we are tempted to give up and stop praying. Don’t allow discouragement to stop you from praying. Trust Him with your request and trust His timing. We know that He has a master plan and works all things for the good of those who love Him and are called according to His purpose (see Romans 8:28). In Luke 18:1-5, Jesus taught. “And he told them a parable to the effect that they ought always to pray and not lose heart. He said, “In a certain city there was a judge who neither feared God nor respected man. Sometimes, the answer is No. In hindsight, I am thankful for many prayers that were answered with a “no.” Now I can see that God protected me from what I wanted that I “thought” was good for me. Sometimes God answers #prayer with a yes, no, or not yet. The answers to your prayers may not line up with your own thinking, but He always answers. Will you trust Him today to answer your prayers in ways you do not expect? In ways that are best for you? Debbie, thank you for your encouraging words. So often we want what we want, when we want it, how we want it. But I have to remind myself that I can’t see the whole picture. I’m grateful that what He wants for us is always good. I shudder to think how many times He must have saved me from myself. Because of Him, #HopePrevails. What a great reminder. Sometimes the hardest answer is “wait”. Thanks for sharing. I know what you mean, Robbi. We want what we want, WHEN we want it. But I’m so grateful to remember that God is never late, He’s never early…He is always right on time. Because of Him, #HopePrevails! I love your Ask Dr.B posts. You answer with such grace and sincerity. I know I am blessed with your gentleness and I’m sure others are too. Thank you for sharing at Weekend Whispers. Mary, your encouragement blesses me. I pray these posts meet someone right where they are. Because of Him, #HopePrevails. Your response reminds me that faith comes by hearing the word of God. We all need His word to remind us of the truth whe our circumstances and emotions are whirling. Hoping in Jesus! So true, Angela!! We all need to remember the truth of His word despite what our emotions and circumstances might suggest! Because of Him, HopePrevails! Stopping by from SDG sisters, so thankful that our God is good, always! Blessings! He absolutely is, Katharine! Because of Him, #HopePrevails! I have had the same experience. It’s a matter of trusting that His way and His timing are best. Because of Him, #HopePrevails. You’re so right, Dolly. We CAN trust His Heart toward us. He is a good Father and His plans for us are good…even when we cannot see how it will work out at the time! Because of Him, #HopePrevails! So glad I found your site on Tell it to me Tuesdays! I will definitely be back:) I love the reminder that God always answers when we seek Him. We must be willing to trust Him regardless of the answer. I pray that you were of some help and encouragement to anonymous. Thank you for sharing this wonderful post. May God continue to bless you in all that you do! Horace, I am thrilled you are here and even more thrilled to hear you will stop by again. God loves to answer our prayers. It’s up to us to trust. There is one thing I trust: His #HopePrevails! So glad we’re neighbors at Word Filled Wednesday! This is a great post. Thanks for sharing. Thank you Laura! So glad you stopped by! Thank you for this post! We are in a period of waiting for our yes and I truly needed encouragement today! Robbie, I love hearing about how God will use the words of one to encourage another just when they need it. Keep seeking Him first. He hasn’t forgotten you. He is working all things together FOR your good. Because of Him, #HopePrevails! What a fabulous response! It can be hard for people to understand why a good God could allow suffering or tragedy. I so appreciate this reminder that God is faithful, even at our darkest hour, and can use our pain for His glory.Thank you for linking to the Sat. Soiree & Social Media Share! You’re featured this week! Thank you for your sweet encouragement and feature, Sarah Ann. We can definitely count on God’s faithfulness. It’s so much easier when we will surrender to Him. Because of Him, #HopePrevails.